OK I am not obviously a West ham supporter but as you can imagine I was tonight. Big Sam’s tactics reverted to the old Bolton way of playing. And they proved very appropriate as Spurs found it very difficult to counter the long balls and Carrol’s aggressiveness in the air. To be fair West Ham played good football when possession was gained in the Spurs half with good passing and movement. And the second goal by Cole was the one that gave us Gooners hope. But no big Sam had to go and change a winning team. His substitutions were the ones that gave the game to Spurs. And what I mean is that by withdrawing Diame for Taylor he gave away the space in midfield for Bale to receive the ball, turn and unleash the winner. The other unforced substitution was totally uncalled for and proved suicidal. Poor Pogatez was out of his depth. He was never in the game, was too slow and not up to speed. Lennon ran rings round him and he gave fouls away to stop the Spurs winger. And that’s how they got their equaliser. Thanks Big Sam. Thanks a lot…. We are all disappointed and frustrated to have witnessed once again the results of Arsenal’s demise over the last eight years. A demise that coincided with the move to the new stadium, the financial constraints it imposed on the transfer policy, the loss of at least five world class players (some going to our main rivals) and their inadequate replacements. The achievement of a top four position and qualification to the CL is seen as good enough achievement by the Board but not by us the fans of course. But even this does not seem possible now with the addition to the teams fighting for these places of Tottenham. Next season you can add Liverpool to that list as I believe that Rodgers is setting the foundations for such a challenge. Yet against Bayern Wenger did not help the cause at all by his team selection but more importantly the formation and tactics. Instead of acknowledging Bayern’s superior quality and trying to combat that, he chose to play like he would always play against any average team playing at the Emirates. He played an attacking formation last night ignoring the protection that the defence badly needed and choosing players that were too offensively minded. Arsenal’s formation last night included only truly defensive midfielder!! The three midfielders were Arteta, who played in front of the defence and stack to his defensive duties as he always does. Ramsey who is definitely not a defensive midfielder and is usually out of his depth for most games in the Premier League let alone against a top European team. He was in any case more often than not stuck further out on the wide side of midfield. And Wilshere who did not sit back to protect the defence of course but was further up field organising the attacks. The three more forward players if you like were Walcott, Podolski and Cazorla. Cazorla did not play as an out and out winger of course but was coming inside more often than not. But he also is not a defensive minded midfielder is he? So we are playing against a top top team, who is up there with the Barcelona’s of this world and what formation and players does Wenger come out with? WITH ONLY ONE DEFENSIVE MIDFIELDER SITTING IN FRONT OF THE DEFENCE. No wonder our defenders looked fragile and harassed. No wonder every time Bayern went forward they looked like scoring a goal. Any defence of any team would really struggle with the kind of protection that Wenger offers to the Arsenal defenders. It is not our defenders who are not good enough but the offensive minded tactics and formation that are to blame. And that is why all Wenger’s teams will always be defensively frail. And such a philosophy only works if you have world class players that can score you more goals than the opposition. We haven’t. We sold them all. 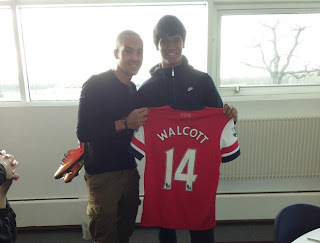 Promising 16 year old Brazilian Matheus Indio has been on trial at Arsenal since the 10th February. Indio, as he is known, has a contract with Vasco until May 2015 and has played for the under-17 Brazilian national team. He is considered as one of the most promising youngsters in Brazil. His dream is to eventually play for a big European team. He cannot do this at the moment as he cannot sign professional terms for Arsenal until he is 18 which will be on the 28th February 2014. His idol at Arsenal is Theo Walcott. And he did get his chance to meet Theo at London Colney and, as the photo shows, he has been given Theo’s Arsenal shirt and boots! No one is giving us a chance. Bayern have fantastic players, are sitting on top of their League, have scored 57 times in 21 games and have let in only 7! Yet I feel that that we can do a runner against them. 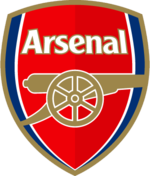 They are a team that, like Arsenal, like to have possession and dominate the play. I say let them do this but when we have the ball we must adopt a fast tempo. Pass the ball quickly to feet and move up the pitch in determined fashion. Just like we did against AC Milan last season and scored three against them. It would be wrong to try and play sideways passes, maintaining possession as we move up the pitch as we do with our opponents in the PL. It works against most teams (maintaining possession I mean) but it usually ends in defeat against the bigger teams. That is why the Arsenal’s formation and player selection should reflect this style of play. As a starter and starting from the front, Giroud should stay on the bench. I cannot see us playing the high ball to him from either the wings or the midfield and risk giving away possession. He is too slow to fit in this type of high tempo game. I think that Walcott should get a start up front. His pace and penetrating runs would create a lot of problems for the opposing defence. I do think however that we need to have a two man midfield shield in front of the defence. This will provide the basis for having enough bodies to win the ball and distribute to the more creative players further up front. I am also of the opinion that Jack Wilshere should not be one of those two players. He is far more valuable and creative when he is playing further up behind the main striker. We do need to win the game after all. We are playing at home in a two leg game. The two defensive midfielders should be Arteta and Diaby. Diaby has played against Blackburn last Saturday so it seems that he may be overlooked and Ramsey preferred. Maybe so but in my opinion if he is fit he should start as he is a far better defensive midfielder than the inexperienced Ramsey who will be playing out of position. In the wide midfield positions Cazorla and Podolski would add penetration, creativeness and a goal threat. Cazorla could come inside to top up the midfield and on such occasions one of the defensive midfielders could cover for him when we are defending on his side. Podolski is good at covering for his defender and/or doubling against the winger. He will also be a threat from dead ball situations. Yes it is very possible to dominate, totally dominate with 16 corners and 13 shots on target and still lose the game with the opponents only shot at goal! And it is possible if you don't play at a fast pace to make your lower level opponent make mistakes and miss a string of chances to score yourself. Diaby was too ponderous. He slowed the game down when what was so obviously needed was to accelerate the pace and put them onto the back foot. They would have had a lot of trouble dealing with fast pace. But no, he kept passing the ball sideways. Rosicky was too rusty. lthough he tried he didn’t offer enough going forward and did not provide penetrating balls through the middle. The Ox huffed and puffed but his crosses were Sunday league standard. And when the crosses got in the right place, there was not enough support from the midfielders to push into the box. AND WE WERE PLAYING AT HOME! Gervinho hasn’t changed a bit continuing to fluff his chances. He can only score when he is playing for The Ivory Coast it seems. But really his level is well below Premier League standard. Coquelin’s positioning was wrong too often. Their only forays into the Arsenal half came from his side and his lack of correct positioning. Their goal originated from a header he lost. Overall our midfield and wide players let us down. Conclusion. Arsenal’s second string is indeed second class. I think Diaby is ready to play in the middle of the defence at Sunderland on Saturday. He is fit, tall enough to compete with the aerial balls O’Neil’s side will throw at Arsenal’s defence aiming for Fletcher and/or Graham and most important of all he will be a far better proposition than Squillaci or the youngster Miquel. With Vermaelen ruled out already and Koscienly having limped off during France’s international game against Germany Wenger needs to think hard how to fill in the void created. Squillaci already has one foot out of Arsenal with his contract expiring in June. Additionally he has not played a first team competitive game in the League this season. He is definitely not ready to start any game let alone this tough fixture at Sunderland. Even when he used to get those rare starts he was a disaster waiting to happen and it often did! Miquel also cannot be trusted to start this fixture where aerial ability and correct positioning will be of paramount importance. This is a no brainer for me. Diaby should start alongside Mertesacker. Sagna and Monreal on either side. The midfield trio will be Arteta, Wilshere and Cazorla. In attack will be Theo, Podolski and Giroud.